For some odd reason I have always been drawn to the movie “Baby Boom” with Diane Keaton. It’s about a successful business women living with her boyfriend in New York. She inherits a baby from a relative and loses control of her career and life and moves to Vermont. She starts making homemade baby food and creates an empire that her former business wants to buy. She turns them down and goes back to Vermont and pursues a relationship with a local veterinarian. The movie always fascinated me, I never really could pinpoint why. Maybe it was the homemade food, or giving up a life you thought you wanted for something else. At any rate, it is a great movie. Odd, yes. Why? I never really had the maternal instinct and if you talk to anyone from my childhood the one thing they knew about me was I was getting out of this small town and going to a big city. I did break out of this city when I was 18, but came back when I was 19 and yes, I still hate it here. But my priorities are very different now. Don’t get me wrong, the big city life will always pull at my heart strings, but I long for a farm with chickens, cows, and a massive garden. My mom always jokes that I should be living on a farm with a huge computer set up and great internet. In truth, that sounds amazing. 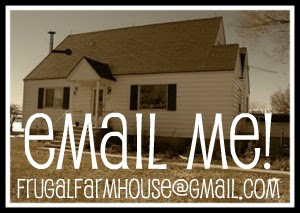 Thus, Frugal Farmhouse. I will own a farm, farmhouse and lots of chickens and cows. I will never regret moving back to Idaho. I know that is what I was supposed to do. I have learned too much to regret my decision. I now know why I have always been drawn to my grandma; she was frugal and lived a self-sustaining life. She is my role model on that level. I spent every summer through my childhood with her. I learned to cook, garden, quilt, sew, clean, etc. etc. etc. I can’t even name all the things she taught me. I am truly blessed to still have her in my life. I know want a self-reliant existence. I want to live how our ancestors lived. I love technology and advances we have made but without the past, there is no future. So as I ponder the next 25 years of my life, I shoot for the farm (ha, get it? Shoot for the moon? I know, I’m a dork.) Whether that leaves me in Idaho or not, will remain to see, but I can’t wait to spend the next 25 years figuring out how frugal living will get me there. Love this post! I love that movie too...haven't seen it in some time...now I'm going to have to watch it again! I'm stopping by from BHF and now following you, would appreciate you following me too. Have a wonderfully blessed day! Hi Brandi, following from Frugal Friday Hop at VB - nice to meet you! You have great photos! Love Baby Boom! But I hear you on wanting to get out of small-town USA, I did a similar thing in my 20's: moved away for college then returned and left again. It's a love/hate thing. When I was there, I got into the routine, but when I move I don't want to go back. ANyway, looks like you have a great thing (farm & family) going! Baby Boom is my ALL TIME favorite movie. I can watch it all day, every day. I have no idea why....but I am addicted. It's why I always strive to be that woman she became with the "mobile over my desk" - love it. Thank you so much for joining the Frugal Friday Blog hope I co-hosted today.